While paying subscriptions to services such as Netflix, premium satellite and cable channels, sports broadcasters and PPV outlets are legitimate ways to obtain content on a TV, there are others that require very little outlay. 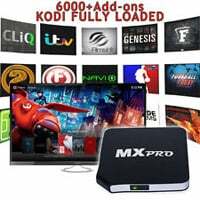 Apple TV boxes, Android set-top boxes and even the lowly Raspberry PI can run software such as Kodi (previously XBMC) alongside third-party addons to provide all of the above at virtually zero cost. Unsurprisingly, this annoys content providers no end. While selling any of the above devices alone is entirely legal, over the past couple of years online markets such as eBay and Amazon have been flooded with “fully loaded” boxes (Android-based in particular) that enable free viewing of anything from first run movies to live sports. Surprisingly, many vendors have been happy to publicly advertise that fact, with many apparently under the impression that if they don’t provide the illegal content themselves then they aren’t liable. In the UK that argument is unlikely to fly and during the past week patience appears to have run out. Earlier this week Trading Standards officers and police carried out raids on sellers of Android boxes setup to receive unauthorized content. 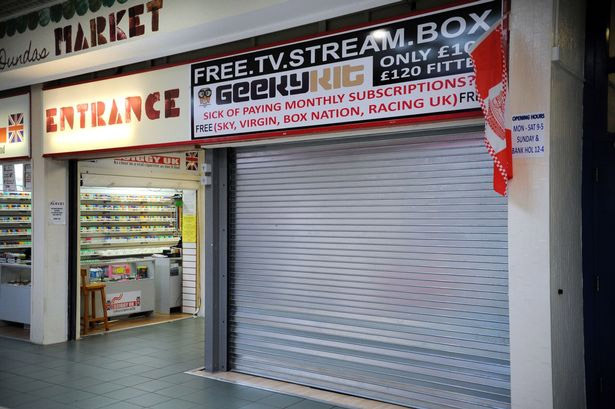 One seller, operating from GeekyKit.com, told customers that his physical shops would not be trading as normal. “As you may be aware we were visited yesterday by Sky [television] in conjunction with Trading Standards. Whilst we continue to investigate our position the stores will remain closed and support will remain suspended. Our sincere apologies for any inconvenience caused,” he explained. Although no details on changes were provided by GeekyKit, the signs on the front of one of their shops will be the first thing to go after leaving little to the imagination. A source who asked to remain anonymous told TorrentFreak that raids were also carried out at home addresses. In those cases officers reportedly seized computer equipment and mobile phones. A 38-year-old man was arrested under the Copyright Designs and Patent Act. The raids have certainly provided food for thought for other companies involved in the supply of similar devices. DroidSticks, one of the most prominent UK suppliers, is now limiting discussion on its Twitter account to matters relating only to the device. Whether or not the company intends to continue packaging third-party addons with its boxes will remain to be seen, but for now ‘pirate’ talk is strictly off-limits. 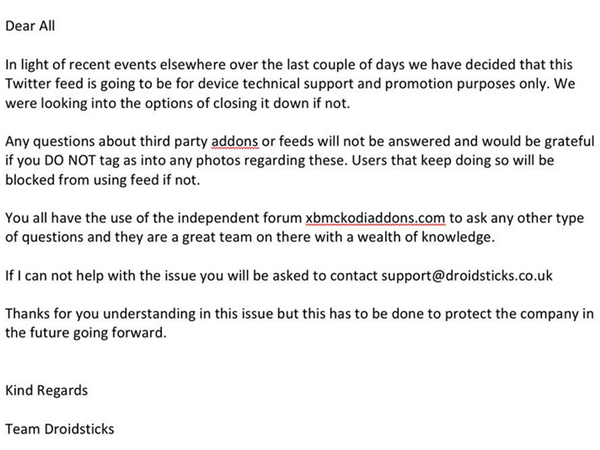 DroidSticks did not respond to our request for comment. Finally, complying with UK legislation should be a fairly straightforward process if sellers want to play it safe, but that will probably mean never mentioning the “special features” of these boxes in a sales pitch ever again. It could also mean relying on users to install their own third-party addons from scratch. It’s a simple enough process for those with patience but something unlikely to appeal to Joe Public who increasingly wants a simple plug-and-play device.